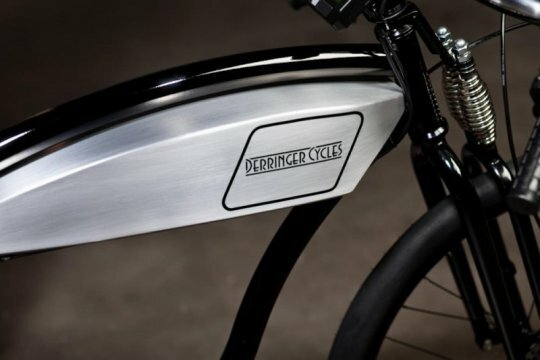 Derringer is offering 3 different electric bike models: The Heritage Series $3500, The Signature Series $4500, and the Bespoke Series $6500. Right now they are being offered on their Kickstarter campaign and they will also be available on their website. The chromoly frames are hand built in Portland Oregon and the bikes are assembled in Los Angeles California. The chromoly springer style fork adds to the classic styling. 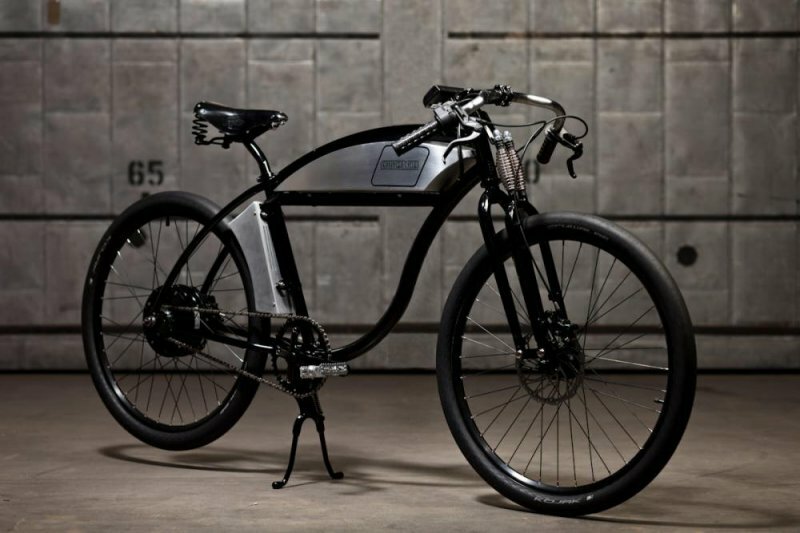 The lithium ion battery is housed in what looks like a fuel tank along the top tube of the frame. There are 3 battery size options: 37V 12.5ah, 52V 12.5ah, and 63V 12.5ah. There are 2 charger options than can recharge the battery in 2-3 hours. 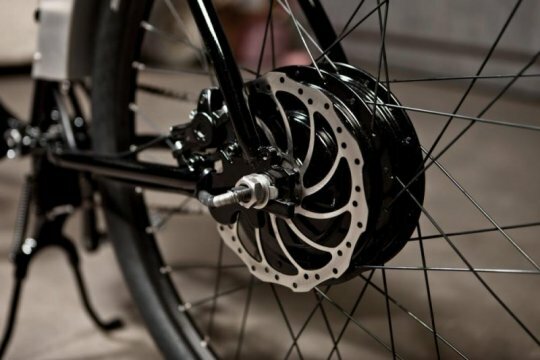 The bikes come stock with a high torque direct drive motor but there is an option for a geared rear hub motor. The bikes come stock in US street legal mode of 750 watts and 20 mph max speed. There is an option to “tune” the bike to provide 2,000 or 2,800 watts of power. A Magura twist grip throttle is the way you add assist and Magura MT2 hydraulic disc brakes with 180mm rotors slow the bike down. 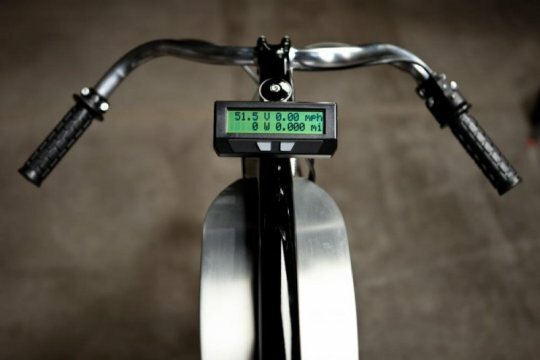 A Cycle Analyst e-bike computer, provides information on its large backlit LCD display including speed, distance, battery info, power, net energy, and more. You can customize a Derringer Cycles electric to fit your style with many colors to choose from, board track style drop bars or cruiser style riser bars, 2 Brooks saddle options, etc. What do you think? Are you interested in a Derringer Cycles electric bike? I like the retro look of the bike, but it is a little high on the price. 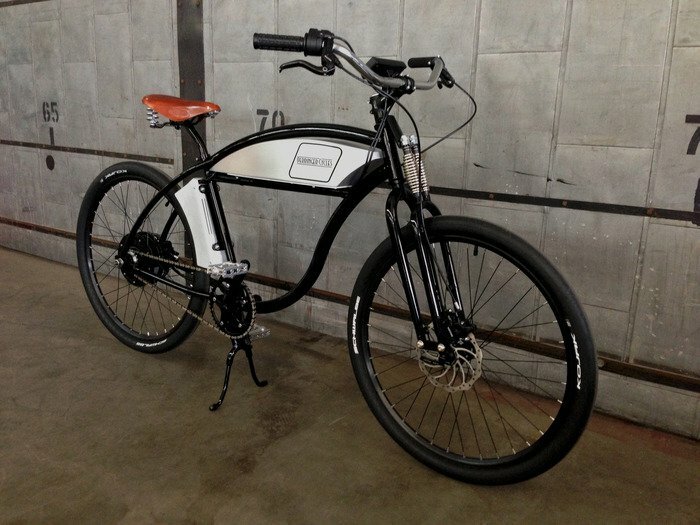 This will appeal to a nich market of ebike buyers. This is a cool bike. Maybe nickel plating rather than chrome, hide the display in a retro catseye housing…. C’mon Michael K. What’s wrong with rich folks riding e-bikes? Us plebes can’t hog all the fun. I can see (fill your favorite hollywood star here) riding this bike, but the average person wanting to get into ebikes will most likely pass this by. It would be cool to see it on Jay Leno’s Garage on Youtube. I have been working on a similar project up here in Sausalito. I think you guys knocked it out of the park personally. wonder if you’ll sell any of your tanks let me know if possible.way to go! where can i find and buy this Bike ? Dominique who lives in France. is the Derringer e-bike available in Italy?